The spookiness isn’t over just yet. Hello Pojo Readers, Crunch$G back here again to tell you what you should know about the latest Yu-Gi-Oh Structure Deck. This deck is a retrain of the 2008 Zombie Structure Deck that was released at the beginning of the 5D’s era and have several cards to help many generic Zombie decks, as most to all Zombie monsters typically synergize with each other. These cards should help boost Zombie strategies, so let’s talk about them. Every new card in here is capable of helping so many different Zombie decks while helping you make good use of the old Zombie World Field Spell. 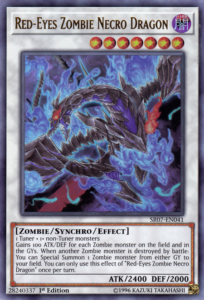 Red-Eyes Zombie Necro Dragon is a generic Level 7 Synchro that gains 100 ATK and DEF for every Zombie monster on the field and in the GYs and when another Zombie monster is destroyed in battle, you can revive 1 Zombie monster from either player’s GY. 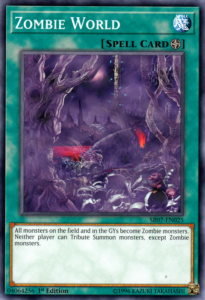 I want to remind you that Zombie World makes all monsters on both fields and in both GYs Zombies, cause that will be important to note for most to all of these cards. 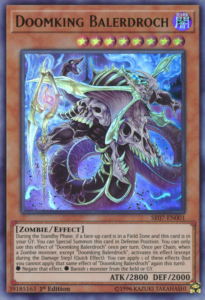 Doomking Balerdroch is a Level 8 Zombie that can revive itself during the Standby Phase if you control a card in the Field Zone, likely Zombie World and when a Zombie monster that isn’t Balerdroch activates it’s effect, you can use its effect to negate that Zombie monster’s effect or to banish a monster from the field or GY, and this does trigger off your and your opponent’s Zombies. Tastunecro is a Level 3 Zombie Tuner that if it was Normal Summoned or Set can let you use a Zombie in your hand as the other material for a Synchro Summon, but the Synchro materials are banished and while you control Tastunecro you can only Special Summon Zombie monsters only, so you’ll be locked into Synchro Summoning a Zombie I believe. 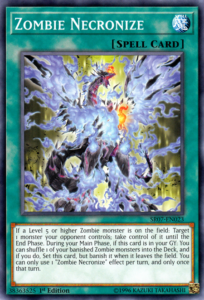 Glow-Up Bloom is a new Level 1 Tuner that when sent to the GY can be banished to add a Level 5 or higher Zombie from your deck to your hand or Special Summon it while you control Zombie World, in either case you are locked to Special Summoning only Zombies for the rest of that turn. Necroworld Banshee while on the field gives your Zombie protection from targeting and destruction effects and as a Quick Effect can be banished from the field or GY to activate a Zombie World from the hand or deck. 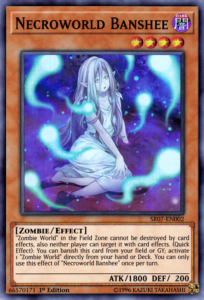 Zombie Necronize is a Spell that while you control a Level 5 or higher Zombie you can activate it to take control of an opponent’s monster during the End Phase and while it is in the GY you can shuffle a Zombie that is banished into your deck to set this to your field but it’ll be banished when it leaves. Zombie Power Struggle is a Quick-Play Spell that can give any Zombie a 1000 ATK increase or decrease and while in the GY can shuffle a banished Zom bie into your deck to set it from the GY but it is banished when it leaves the field. Return of the Zombies lets you banish any Zombie on the field to revive a Zombie from the GY of the player who controlled said Zombie to their field and can also shuffle a banished Zombie into the deck while in the GY to set itself again but it will be banished when it leaves. The final new card is one that was in an OCG Premium Pack that got reprinted in their version of this deck, but is getting printed for the first time in the TCG version, Haunted Shrine is a Trap that while you control no monsters can let you Special Summon a Zombie from your GY and you can later banish Haunted Shrine from the GY to Special Summon a Zombie in your GY but its effects will be negated. I mean, the deck focuses on Zombie World a lot, so you have to have a Zombie World reprint in here. You also got some good generic Zombie cards reprinted in here like Zombie Master, Mezuki, Gozuki, Goblin Zombie, Shiranui Solitare, and Uni-Zombie. Beast of the Pharoah is getting its first reprint outside of an OTS Pack, which is somewhat worth noting. Marionette Mite is a solid Hand Trap reprint that synergizes with Zombie World. Book of Life is another good Zombie related card in here. You got a Foolish Burial, which is never bad to have no matter how much it is reprinted. 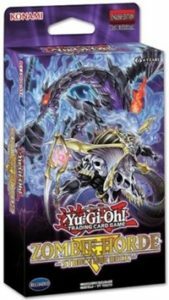 Monster Gate gets a reprint in here. Dragged Down into the Grave is a good reprint since it has recently seen some hype. Burial from a Different Dimension is another good Spell for Zombies that is reprinted in here. Shared Ride is reprinted in here which is important since it has also seen hype recently. Needlebug Nest and Metaverse are good reprints in the Trap section, but the two better Trap reprints in here are Anti-Spell Fragrance and Mask of Restrict. All of these cards really do give Zombies a boost, whether it is a generic Zombie deck or in a Zombie archetype deck. There is a decent amount of focus on Zombie World, which isn’t that bad since Zombie World is actually a good card still and didn’t need a retrain in this deck, though one would of been nice. There are also some solid staple reprints in this deck, so in all honesty it is worth picking up if you are a Zombie fan or just want some good reprints in general.